Over five days we will take an in-depth look at the skills needed to lead groups in the mountains. We will begin with three mornings skiing on the Les Deux Alpes glacier. Afternoons activities in the Alpine environment will be followed by classroom sessions. 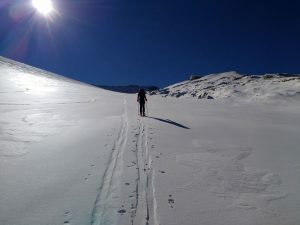 On-snow we will cover navigation, snowcraft, the basics of ski touring, and transceiver skills. Off-snow we will reinforce all of the above. Expect transceiver practice, navigation exercises and ropework. In the evenings, we will have short classroom sessions on avalanche awareness, navigation and weather. The final two days will consist of an overnight expedition, staying in a mountain refuge. This will give us plenty of time to focus on navigation, leadership, group management and the mountain environment. The course will be delivered in small groups by fully qualified BASI Level 4 instructors and UIMLA certified International Mountain Leaders. We will have a maximum of four students four per instructor on-snow to ensure we have lift queue priority. For more information on the Mountain Safety/EMS prep. course, or to make a booking enquiry, please contact us using the form below.